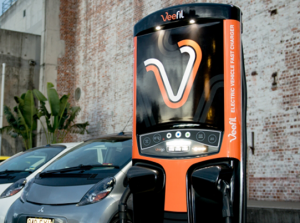 Energy retailer Locality Planning Energy (LPE) has announced the deployment of the first super-fast, commercial electric vehicle (EV) charging station in Australia. According to the company, it is one of five stations with fast charge capabilities to be deployed across Southeast Queensland, allowing drivers to charge EVs 25 times faster than standard chargers. The 50 KW DC fast charger, which is capable of adding 50km range to an EV battery charge in just 10 minutes, was developed and manufactured by Brisbane-based Tritium. Utilising LPE’s embedded energy networks, the charging station will also be the first commercial station in the country to provide electricity to an EV at a rate cheaper on a km-to-km basis than for a combustion engine. In addition, drivers will be able to check the charging station’s availability, reserve a charging space and monitor their car’s charging process through the use of a dedicated mobile app. LPE’s Director and CEO, Mr Damien Glanville said drivers will pay for the exact amount of electricity used to recharge their vehicles, making it just as cost effective as home charging. “The charging station marks an exciting development fir electric vehicle owners and we are thrilled to combine the power of Tritium’s cutting-edge and award winning technology with our embedded electricity network to make charging faster, easier and more cost effective than ever before,” he added. Mr Glanville said the charging station was installed at the Noosa Blue Resort in Noosa Heads, Queensland, which was the first of five sites earmarked for EV charging station deployment in Southeast Queensland. “With advanced infrastructure that makes EV charging more convenient and accessible, we hope to accelerate the adoption of EVs across Australia and enable greater flexibility for drivers,” he said. Tritium Commercial Director, Mr Paul Sernia said facilitating an advanced charging infrastructure was key to accelerating the adoption of EVs, both domestically and overseas. “We have seen growing demand for EVs around the world and as the only Australian company to design and manufacture EV charging stations locally, we look forward to demonstrating how the technology can enable more sustainable and cost effective transport,” Mr Sernia stated.